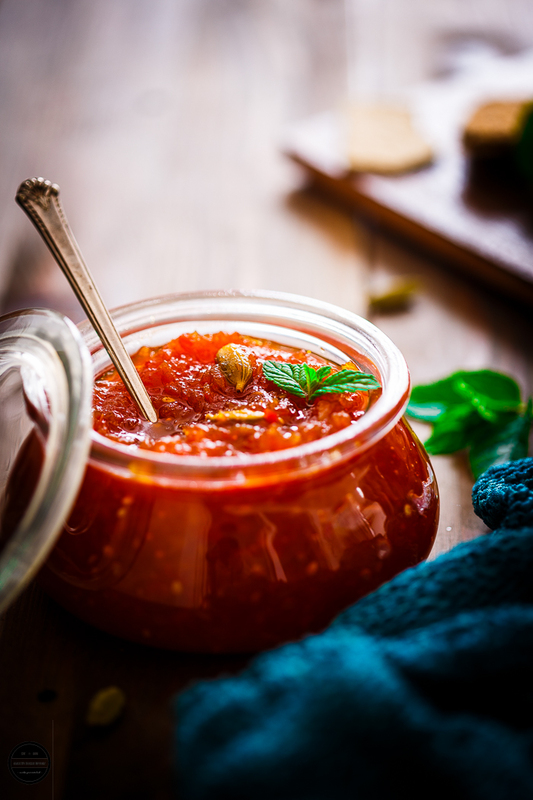 This magnificent and fruity Carrot, Tomato and Cardamom Chutney is sweet and mildly spiced - a bit of kick from the red chilli and flavoured with aromatic cardamom. A beautiful combination of flavours in a jar! As much as I love to prepare Indian style fiery, tangy and sweet chutneys to go with our Indian meal, I also love to whip up English sweet and mildly spiced chutneys too. Ones that perk up your cheese and biscuits or jazz up your sandwiches if you use it as a filling. 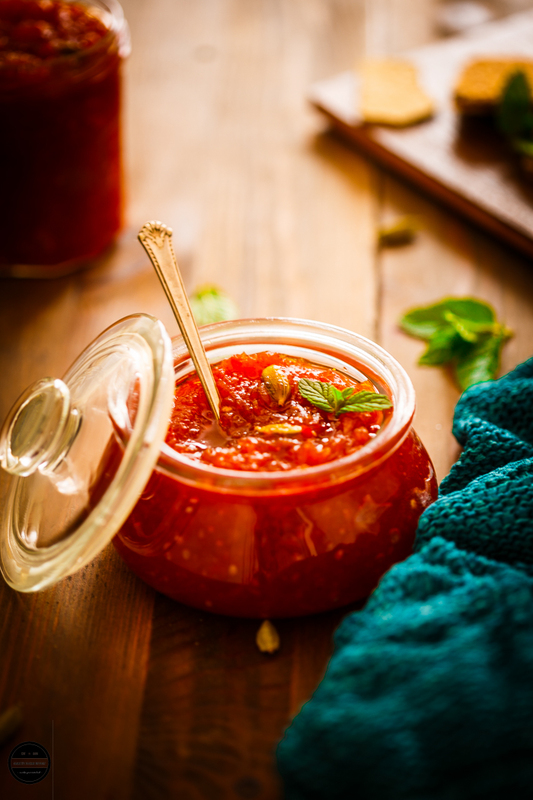 I adore these fruity chutneys which wonderfully works alongside Indian meals too. 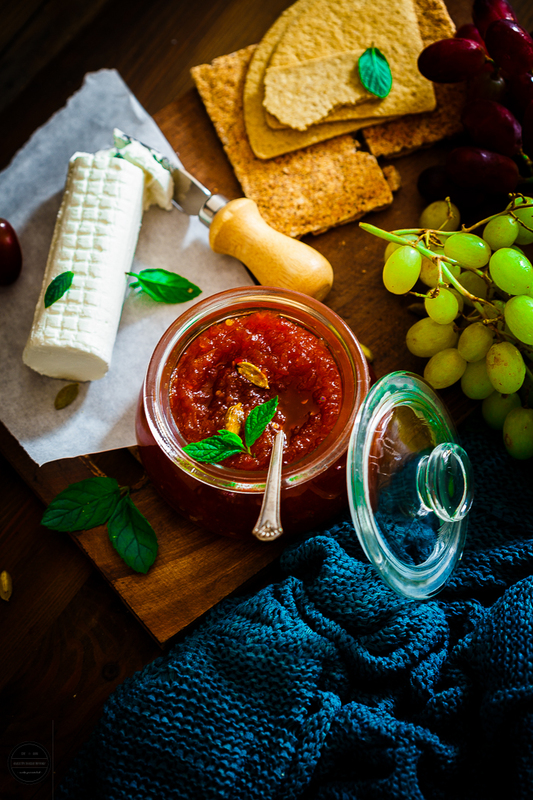 These chutneys are so versatile, sometimes I add in plain yogurt and serve with crisps, tortilla chips or toasted pitta bread as a starter. Have you tried roasting root vegetables with it? Just mix a tablespoon of chutney and little olive oil, drizzle on parsnips, sweet potato or carrots. 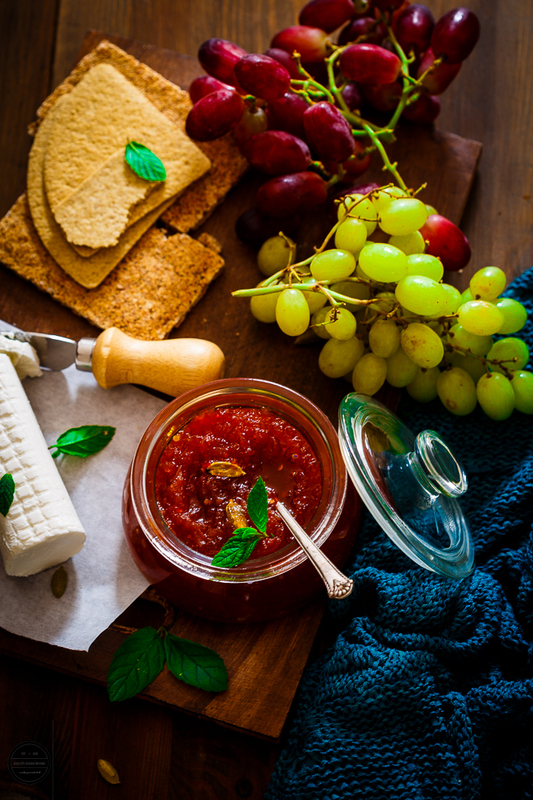 My husband has his own way to use it, he would spread a teaspoon full of his favourite chutney on whole grain toast, and sprinkle some cheddar cheese before grilling again, so delicious! So I have a plenty of reasons and excuse to prepare another batch of new chutney recipe as we have finished my summer batch of Apricot, Sweet Pepper and Thyme Chutney. This time I decide to make Carrot, Tomato and cardamom Chutney, for this recipe I did not have to go to markets or shop, All the ingredients are from my pantry and direct from my vegetable patch as it was overflowing with carrots and tomatoes. 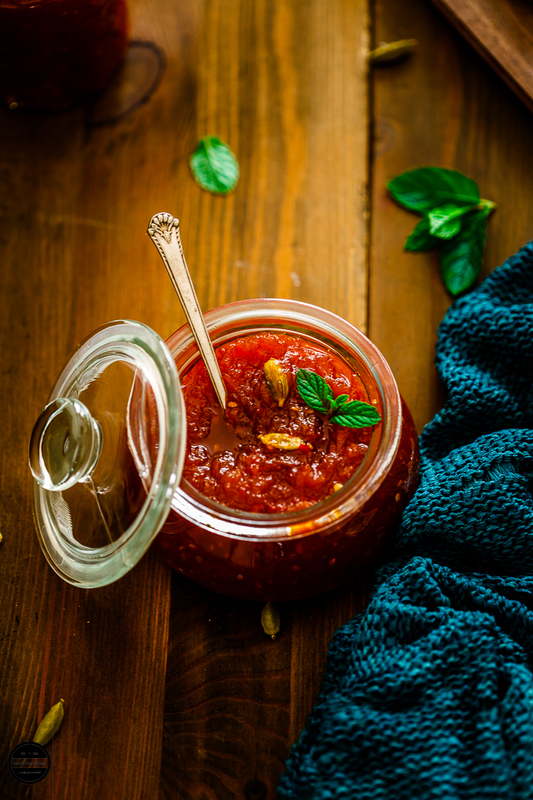 One afternoon, everything went into a pan and in less than an hour, I had this finger-licking and delightful chutney ready, once it was cooled, stored in sterile jars and ready for through winter months. Now that Christmas cheer is in the air its a reminder to pack a few gifts and pressies for friends and family because Christmas is all about joy and festive cheer. It's also about caring, giving and receiving. 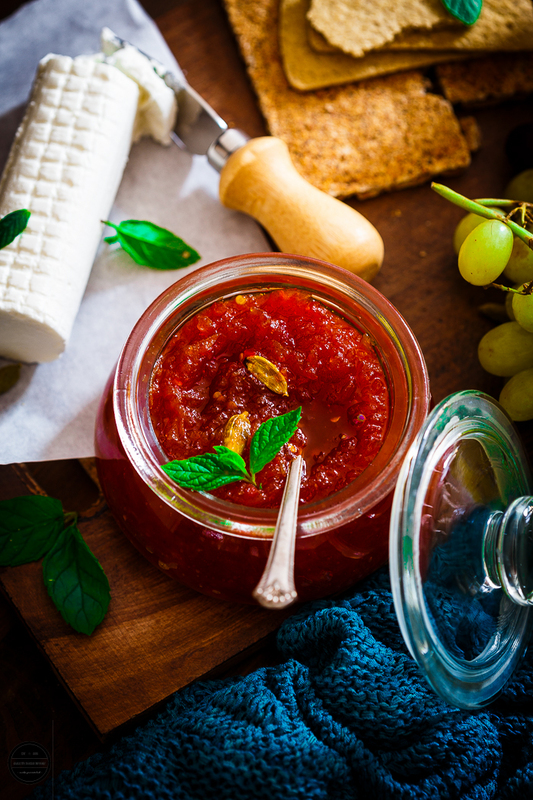 This homemade chutney makes a great edible gift for a foodie friend or a family member as homemade gifts are so special, there is always a personal touch. Mint leaves are only for photographic purposes, did not go in making this chutney. 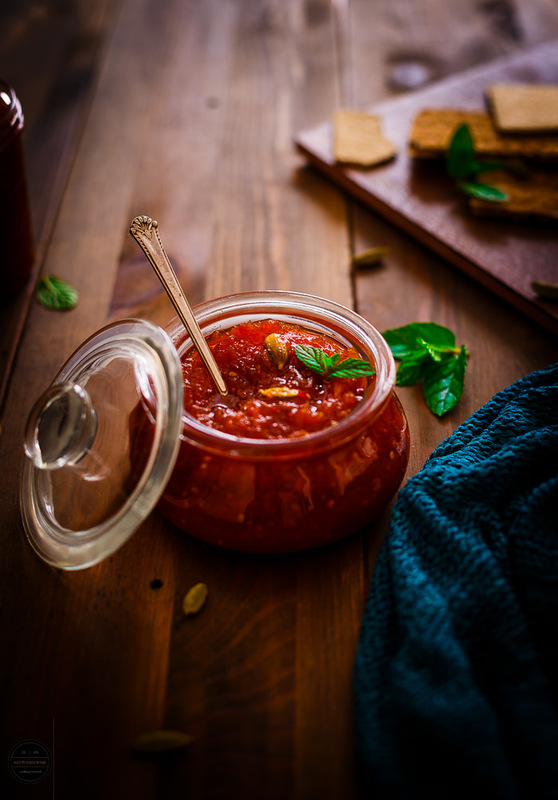 This magnificent and fruity Carrot, Tomato and Cardamom Chutney is sweet and mildly spiced - a bit of kick from the red chilli and flavoured with aromatic cardamom. A beautiful combination of flavours in a jar! Extremely simple and foolproof recipe calls for the most basic ingredients but it never seizes to impress!! Keep few small sterile jars ready.Heat oil in a pan, add chopped onion, cook very slowly for about 15-20 minutes or until the onion becomes sticky.Add all the chopped ingredients, ginger-garlic puree, sugar, vinegar.Mix well.Lightly crush the cardamom and add everything to the pan. Add red chilli flakes too.Mix everything and keep stirring.Next, bring everything up to the simmering point let it cook for 40-45 minutes. When the liquid reduces, you will get very thick and sticky chutney.Switch off the heat. Spoon it into sterile jars.To keep for a longer period, keep it in a cool dark place. Once opened keep it in a refrigerator and use it in a couple of weeks.Enjoy! Love this chutney! Your photos are great too. Love that colour.. It looks sinful and beautiful pics!! I love this chutney and the colour is simply mesmerizing! Love this chutney Jagruti. Beautiful pics. What beautiful blend of flavors!! Looks and sounds amazing! Love the colour of the chutney and yes they would make lovely gifts. Jagruti did you peel the tomatoes? Thanks mayuri for your comment. No, I did not peel the tomatoes. That is deliciousness in a jar! And a great gifting idea too. I am dreaming of spreading this over a toast and indulging!! And your pics are stunning!!! Such amazing looking chutney. Love the bright red color and the pictures are outstanding. I am speechless. This sounds delicious so have you made me a jar for Christmas??? Its a take on the mango chundo. Chutney looks so good. Nice with parathas and theplas.